Does Your Passion Seem To Eat You Up? Something very spectacular happens during the beginning days of Jesus’ ministry right after the miracle of turning water into wine. John 2 reports Jesus going wild and destroying all the merchants’ property in the temple and driving them all out of the place with a whip that He made from some ropes. Can you imagine a Jesus like that? He was least bothered about what people were going to say or do after that. In today’s world Jesus could’ve gone to prison on charges of rioting and destruction of property. Moreover, Jesus held no occupation within the temple that gave him the right to do anything to the protect it’s dignity. Let me ask you these few questions. The answers to them will help you know the extent of passion you carry in your heart. 1. Would you evangelize people at the risk of getting imprisoned for the same? 2. Will you continue to teach and preach biblical principles inspite of knowing that the law of your land criminalizes saying Homosexuality is a sin? 3. Would you still keep witnessing about Jesus to your friends and family, knowing the fact that you might lose their respect, friendship and relationship if you do so? 4. When you see something wrong in the church you are actively attending, would you ignore it or get it fixed, even at the cost of getting expelled out of there? 5. On being convicted by the Holy Spirit that you are trespassing against God, would you risk losing all your social gatherings and following in order to admit that you were wrong? Please understand that I am not trying to promote breaking the laws of the land. But there is no law higher than the commissions and the commandments of God. Nor am I saying that you should walk around judging or hurting people for them not being believers. But will you stand up for what you believe? It doesn’t always begin with an all consuming passion in your heart. It begins with a small spark of a desire to honour God in everything you do. 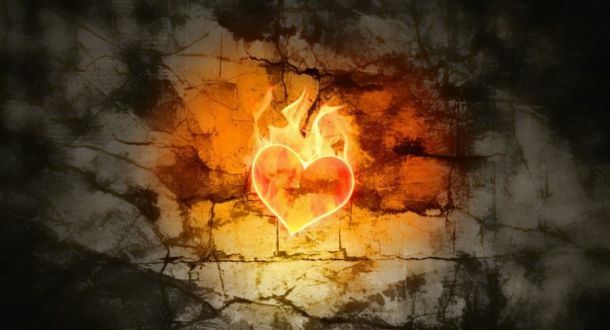 That when you continue to fan to flames through the Holy Spirit who baptizes you with fire, turns you into a mighty arson that foils all the wicked plans of the enemy over your life, your church and your land. All that is required for evil to prosper is for good people to do nothing. And you really can do nothing until there’s a zeal and a passion for God that is consuming your every desire and ambition. But when you give in to that consuming fire, your life will burn with God’s desire and ambitions. Do you feel a passion burn in your heart as you read this post? What would you do to fan that passion into flames that will actually consume you? Name a few things you’ve done or would like to do, when under holy passion. Comments below!